We pride ourselves on offering beautiful, unique handmade jewelry and treasures direct from the artist's studio combined with excellent customer service. The above quotes are but a few compliments we've received out of the many thousands of orders we've filled over the past few years. A: RETURNS: If you wish to return your item, we will require you to first contact us via e-mail at jessicaagalbreth@gmail.com with the reason you'd like to return the order. We do not supply return labels. You will be responsible for mailing the order back to us at your cost (First Class mail is normally very inexpensive). We'll expect you get the items back on their way within 5 - 7 business days from corresponding with us. IMPORTANT: You must return the items as we sent them to you (unused and unworn and in the boxes or gift packaging that they came to you in). Trying the item on once is okay, but if you have worn the piece, we cannot accept it back. Once we get the item(s) back in good condition, we will offer you a refund or store credit (your choice) for the product price less a 10% restocking fee (shipping is not refunded). Please note that we are unable to accept returns on our perfume oils. A: CANCELLATIONS: Because we hand make items to order and begin creating them shortly after you place your order, cancellations are subject to a restocking fee. If you change your mind after you've placed an order and wish to cancel, your refund will be subject to a 10% restocking fee. To cancel, please contact us ASAP at jessicaagalbreth@gmail.com with your cancel request. If we have already shipped, you will need to treat this as a return (see above). Q: Are your prices in U.S. Dollars? A: Yes! As a U.S.A. based company, all of our prices are shown in U.S. Dollars. We do not offer conversions to other currencies, but you can easily do that on-line using a free conversion tool. If you use another currency, your statement may reflect a different total than your e-mail receipt because our e-mail receipt and total will ALWAYS be in U.S. Dollars only. A: Using our secure, safe on-line shopping cart system, you can opt to pay with your Visa, Mastercard, Discover or American Express card, or via your Paypal account. I'm sorry, but we do not accept mail in orders with checks at this time. You will see us on your Credit Card statement as "The Vintage Angel". Q: I just placed my order, what happens next? A: Once you've ordered, you should get an e-mail confirmation from our shopping cart system at the e-mail address you provided. 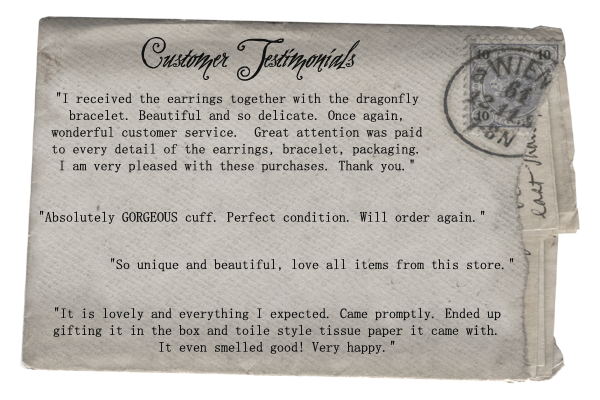 Since many of our items are made to order, you can expect us to ship your order within 2 weeks (we need this time because we hand make our jewelry items to order (see below). Q: Why do you need 2 weeks to complete my order? A: Because our items are handmade to order by the artist and her husband in their studio, we require 1 - 2 weeks for all jewelry orders. While the web site shows an item as available for ordering, it is not yet made at the time of the order. We do our best to ship quickly, but sometimes need that full amount of time due to the intricate nature of the work and the amount of other orders we are handling at that time. We truly appreciate your patience! Q: How will my items come? Q: How long will it take for the order to arrive once it ships out to me? A: That depends directly on your location. We are located in Ohio, U.S.A. and generally use First Class or Priority Mail for shipments traveling within the U.S.A. Most of these shipments take 2 - 4 days in transit, but First Class can occassionally take up to 7 days in transit. International orders sent ouside the U.S.A. can take several weeks (4 - 5 weeks on some occasions). International customers, please see the next section for important info. Q: I live outside the U.S.A. Can I still order and what should I expect? A: We ship to most countries in the world. We no longer ship to Mexico or South Africa due to past delivery problems. There are some important things you should take note of if you live outside the U.S.A. and wish to order from us. First, we use First Class mail for all packages going outside the U.S.A. This is a relatively inexpensive service so that we can keep our shipping costs low for you. However, this service can take several weeks - even up to four and five weeks on some rare occasions. Please do not be alarmed if it takes several weeks to a month for your package to arrive once you get your shipment notification. This is completely normal and should be expected. Also, the tracking number associated with this service will only show updates until the package leaves the U.S.A. (normally from Chicago). Then, the updates will seem to stop. This is not because the package is lost or stuck, it is because tracking stops once it leaves the country. It will then simply arrive to you within several weeks. IMPORTANT! There is a chance that your country will charge you a customs or duties import fee in order to release the package to you, especially if you live in the U.K. or Canada. Please understand this is something that we cannot control and the money collected goes to your country (not to us or the United States). We are required by law to state the value and manner of your purchase on customs forms, so please be prepared for this. We are unable to mark packages at lower than their value due to Federal mail regulations. Q: Do you do custom jewelry or art orders? A: At this time, we have no plans on creating a printed catalog. Please consider this web site as our official catalog. A: At this time, we are so busy with our regular web site orders, we don't have the capacity to wholesale. If that changes, we will update that information here.